Are we ready for a mobile-first world? 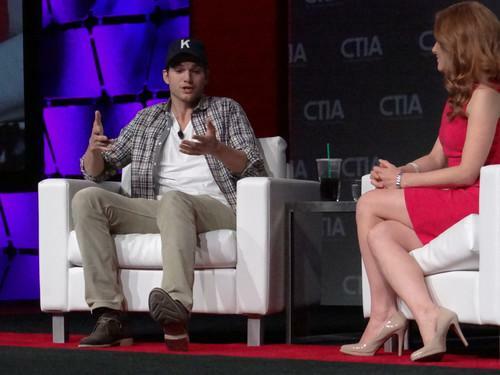 Ashton Kutcher was interviewed by CNBC reporter Julia Boorstin in a keynote session on the final day of CTIA Wireless on Thursday. Judging from the number of people poring over their smartphones on the sidewalk, in their cars and in public places, mobile seems to have stolen our attention away from the wired Internet and traditional TV. However, there is a ways to go before mobile platforms become the primary place where consumers turn for entertainment and getting things done, players at this week's CTIA Wireless trade show said. Nokia Siemens Networks announced new capabilities in its network software to make video streams run more smoothly over mobile networks. Among other things, the enhancements can reduce video stalling by 90 percent, according to the company. But even Sandro Tavares, head of marketing for NSN's Mobile Core business, sees "mobile-first" viewing habits as part of the future. "Now that the networks are providing a better capacity, a better experience with mobile broadband, mobile-first will come," Tavares said. "Because the experiences they have with the devices are so good, these devices ... start to be their preferred screen, their first screen. "This is a trend, and this is something that will not change," Tavares said. But he thinks it's too early to build networks assuming consumers will turn to tablets and phones as their primary sources of entertainment. "Do you have to be prepared for mobile-first now? Probably not. You have to be able to keep the pace." For AT&T, mobile-first is a top priority for its own internal apps, ensuring employees can do their jobs wherever they are, said Kris Rinne, the carrier's senior vice president of network technologies. But to make it possible over the network, a range of new technologies and relationships may have to come together, she said. For example, giving the best possible performance for streaming video and other uses of mobile may require steering traffic to the right network if both cellular and Wi-Fi are available. AT&T is developing an "intelligent network selection" capability to do this, Rinne said. When AT&T starts to deliver voice over LTE, it will stay on the cellular network -- at least in the early days -- because the carrier has more control over quality of service on that system, she said. Other issues raised by mobile-first include security of packets going over the air and rights for content that subscribers are consuming primarily on mobile devices instead of through TV and other traditional channels, Rinne said. "I think we have the technology piece parts. It's how we bring them together to optimize that, to provide those solutions to get us to that kind of vision," Rinne said. To entertainment audiences, mobile may already be in front, but most content providers haven't taken advantage of that, said Ashton Kutcher, the actor and venture capitalist, who spoke in a keynote session on Thursday. Most content providers have focused on mobile and traditional platforms competing for eyeballs. Viewers may be able to watch on a mobile device, but there's no "additive experience," Kutcher said. Sports programming is the rare exception, he added. So-called two-screen experiences have mostly involved trying to fit a mobile component into a traditional show, Kutcher said, and he thinks that's the wrong approach. "The assumption is that the mobile device is the second screen, and I think that the mobile device is actually the first screen," Kutcher said. He likes the concept of mobile users getting together and deciding what mobile content they want to share on a big screen, then transferring it there. With other types of services, the Web still has a big role to play, Kutcher said. Developing in HTML5 may the best strategy, because it's still too hard to discover apps, he said. "I don't think we're at a place where mobile-first is a must yet. ... You still have to consider desktop and PC, and how they relate," Kutcher said.